Commuters are facing a dance with death at the blind spot in the tram tracks as you approach Piccadilly station from Canal Street or the courts. 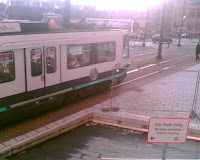 This picture here shows a tram having narrowly missed a punter who didn't see the tram coming. Trouble is, you have to stand on the tracks to look around the corner in both directions if you're heading from Piccadilly station. Even when City Inn has been built I can't see the pathway being any safer.